McDonald’s recognizes the the importance of breakfast and the role it plays in the lives of many Filipinos, thus on National Breakfast Day on March 18, 2013, ‘Hooray for Today’ campaign gives Filipinos an opportunity to taste just how good breakfast at McDonald’s. Around 300,000 free McMuffins will be given by McDonald’s restaurants offering breakfast nationwide to encourage customers to start their mornings on a positive note with a delicious breakfast at McDonald’s. Free McMuffins will be given to the first 1,000 Customers on National Breakfast Day from 5:00 AM to 9:00 AM via dine-in, take-out, or drive-thru. No Purchase required. McDonald’s Egg McMuffin is a tasty and filling sandwich to have in the morning. The Egg McMuffin is made with lightly grilled Canadian bacon, freshly cracked Grade A egg and melty American-style cheese sandwiched between warm perfectly toasted English Muffins. McDonald’s Egg McMuffin is a great perfect breakfast choice for people who are on-the-go. On the National Breakfast Day, an estimate of 5 million McMuffins will be given away in celebration of this event by McDonald’s Philippines, together with 5,000 McDonald’s restaurants in Asia, Middle East and South Africa. Filipino customers will join in the fun and have another great reason to cheer ‘Hooray for Today!’. For more information visit www.mcdonalds.com.ph or like the official McDonald’s Facebook fan page facebook.com/McDo.ph. Hashtag for that day is: #nationalbreakfastday. 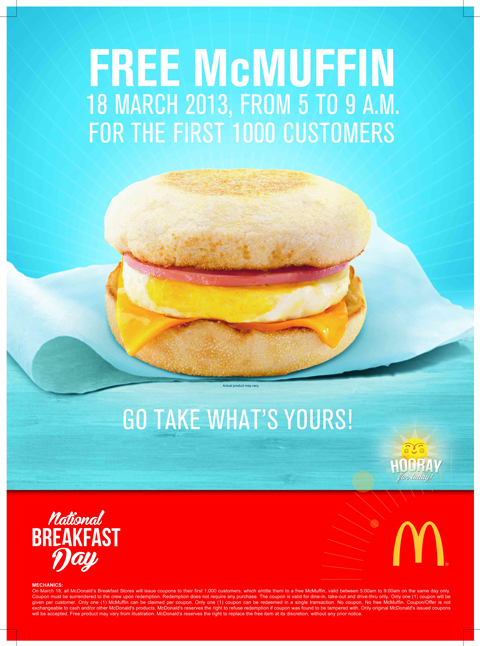 0 comments: on "McDonalds' gives Free McMuffins to 1,000 Customers on Nat'l Breakfast Day"